I'm obsessed with this salad. I created it about 2 years ago and have been making it in cooking classes and healthy eating presentations every since! 1. It's a spectacular celebration of cold weather produce. Kale is at it's best in the fall and winter months - showing off it's sweeter side and offering a softer texture. Fennel brings a fragrant, earthiness, a wonderful crunch, and a licorice/anise flavor that is so wonderfully balanced by the creamy avocado & the bright citrus fruits (oh my gosh, yum!). Juicy, colorful citrus are like playful jewels bringing so much life to this dish, and tons of much needed vitamin c, beta carotene and other antioxidant nutrients. And then there the bright pop of fresh pomegranate seeds, that bring a playful crunch and a delightful tart, yet sweet bite. 2. It's a crowd pleaser! And, it doesn't wilt - making it the perfect salad to bring to a holiday gathering. 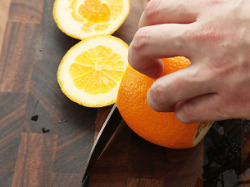 So, without further ado - please dig into my Winter Citrus Salad. Your taste buds are gonna love you. Rinse and dry kale stems. Separate the kale leaves from the stem, chop or tear into approx. 2 inch bites and add to a medium size bowl. Add avocado, lemon juice & zest, honey and salt to the kale and massage into the leaves with your hands. You’ll want to mix the salad until the avocado resembles a purée, and all the kale leaves are evenly coated. This will be your dressing, and the oils from the avocado will soften up the kale. You can refrigerate the salad while preparing the rest of the ingredients. 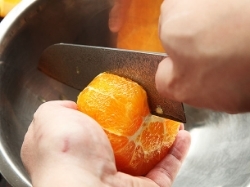 Trim each end of the fruit, so that you can see the flesh and have cut off most of the white pith. Work around the natural contour of the fruit, to save as much flesh as possible. Finally, Top kale mixture with citrus, walnuts, fennel & pomegranate seeds. Serve immediately, or refrigerate for up to 2 days. I hope you love it as much as I do. Please feel free to share it with friends & family - it makes a wonderful addition to the holiday table.